So what is this one pot wonder? I like to think of it as bringing all my guest together and sharing a meal that makes you feel like a kid with no etiquette restraints, except those of gratitude of sharing a wonderful time with family and friends around the dinner table. 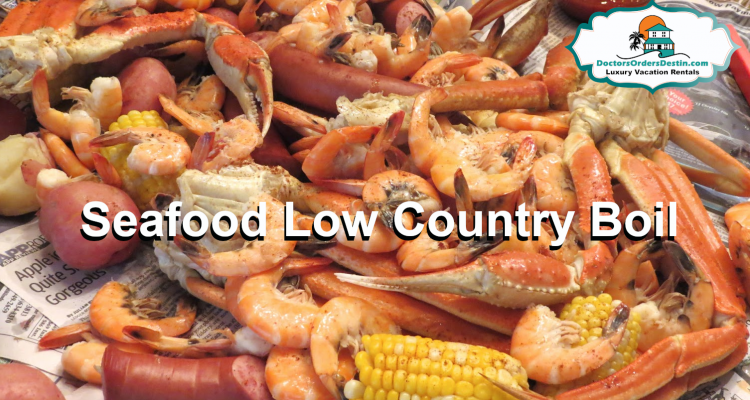 This Low Country Boil is a regular meal we all share at the beach house. So of course, everyone is willing to participate and come together. Your little ones will think all the grownups have lost their minds. It’s so confusing when you don’t use fork, knife or spoon and no plates. Just your hands and fingers, occasionally a napkin or two. This temporary total loss of etiquette is due to the food delirium which is closely followed by the fall into a food comma. So, let me share with you what I am talking about and I encourage you to try it next time you are staying with us at DoctorsOrdersDestin. To start off, you will find a well-stocked kitchen which provides the Stockpot with a removable drain basket. This drain basket will help you lift all those treasures out of the stockpot to spill out on to the table so everyone can join in the fun. Add whole potatoes and seasonings into a large stock pot with drainable basket add water 2/3rds of the way up the stock pot to assure enough water to cover all the items going in. Cover pot and heat to a rolling boil, cook about 5 minutes. Add sausage and corn, return to a boil. Cook 10 more minutes or until potatoes are tender. Add Shrimp, lobster tails (I will cut these in half, length wise to double the amount of lobster ) and crab legs to stockpot, cook until lobster tails are bright red and shrimp is pink. This will take about 4 to 6 minutes so watch it carefully it will cook fast. Then Pull the drain basket out with all of its bounty, let it sit while you prepare your table with newspaper. I will use a heavy-duty brown wrapping paper that I find at the hardware store to cover my table with or you can use the brown paper grocery bags just cut them open to cover your table. Don’t use a plastic table cloth even though it may seem like a brilliant idea, the remainder of liquid from this wonderful meal will run off the table into your lap or floor and then you have a unwanted mess. Instead of an easy roll up all the paper into one convenient ball and place in a garbage bag and throw it out in the trash your done with cleanup! Finally, take your wonderful basket and spill it on to the table. Drizzle some olive oil over with a sprinkle of sea salt and fresh chopped parsley. Serve with some small dipping bowls of garlic butter and some hearty rolls or cheesy biscuits. 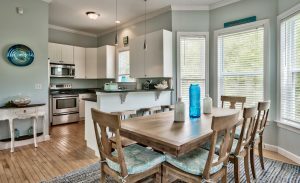 You may want to add a frosty beer or some sweet tea or your favorite beverage, whatever you choose you won’t be disappointed and this will be a planned favorite meal each time you get together here at DoctorsOrdersDestin Beach house. 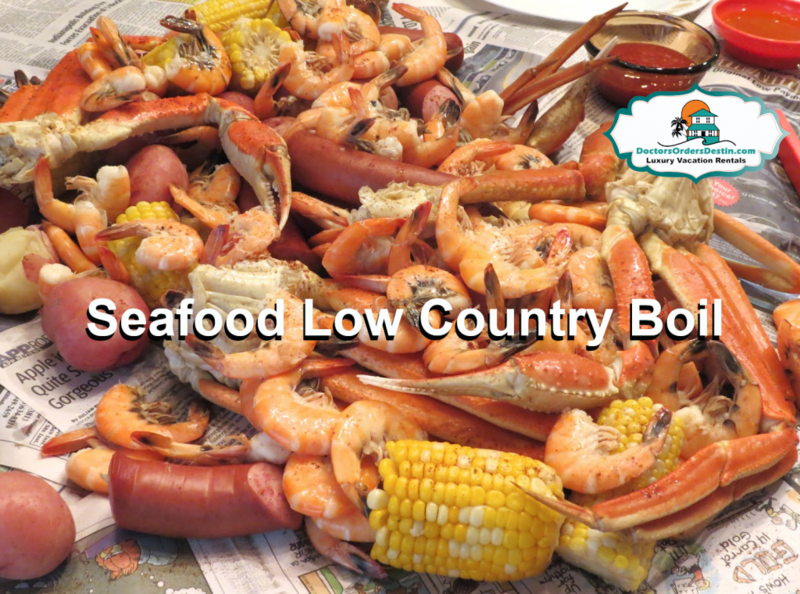 So enjoy this Beach House Special Seafood Low Country Boil together with your family and friends.